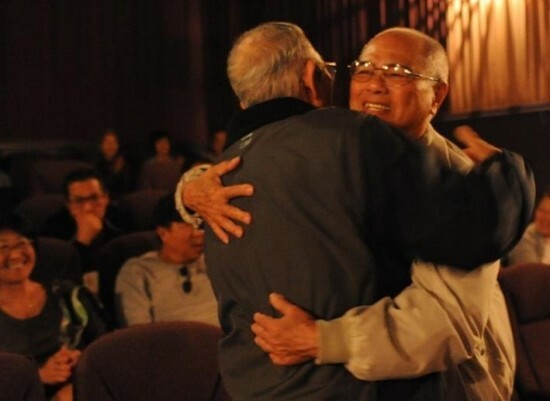 PASADENA — An unexpected reunion occurred when Cory Shiozaki showed his documentary “The Manzanar Fishing Club” at the Laemmle Playhouse 7 in Pasadena on April 22. It turned out to be long-lost friend Hidekichi Nagamine, whom Mizutani hadn’t seen in over 30 years. It was an emotional moment with several women in the audience tearing up. The documentary is about internees at Manzanar who slipped away under the cover of night to find freedom and adventure, matching wits with the prized trout of the Sierra Nevada to bring fresh fish to their fellow internees. In addition to Pasadena, “The Manzanar Fishing Club” was shown over the weekend at Laemmle theaters in North Hollywood, Claremont and Santa Monica. On Friday, May 4, it will open at the Regency South Coast Village in Costa Mesa, the Landmark Embarcadero in San Francisco, the Landmark Shattuck Cinemas in Berkeley, and the Landmark Aquarius in Palo Alto. For more information, visit www.fearnotrout.com or the “Manzanar Fishing Club” page on Facebook. The film is one of the honorees of the Cherry Blossom Festival of Southern California’s Camp Stories Award Show, “Do the Dream,” on June 2 at Santa Anita Park. For more information, go to www.CherryBlossomFestivalSoCal.org.